Strength training is the systematic application of load to progressively overload the body. When coupled with adequate recovery it can produce significant gains in a person's ability to produce force, resist injuries, and be more productive in work. The body does this through a process called mechanotransduction, where physical stress/force stimulates your body's genetic code to build more resilient tissues (bone, muscle, tendon, etc.). This extremely versatile machine has the convenience of two pulley systems as well as a Smith Machine. Two 150lb weight stacks allow for most exercises to be performed at a high level of load. Functional trainers are great because they allow dynamic exercise in a controlled system. The Smith Machine allows us to introduce squats and dead lifting exercises to all patients with the safety of a lock-out bar. This piece of equipment will be a cornerstone of early rehabilitative loading (mechanotherapy). The kettlebell is a traditional Russian cast-iron weight that looks like a cannon ball with a handle. The kettlebell is one of the most versatile tools for building strength. They are compact, inexpensive, virtually indestructible and can be used almost everywhere. Regular kettlebell training can develop many physical attributes (strength, power, endurance, etc.). 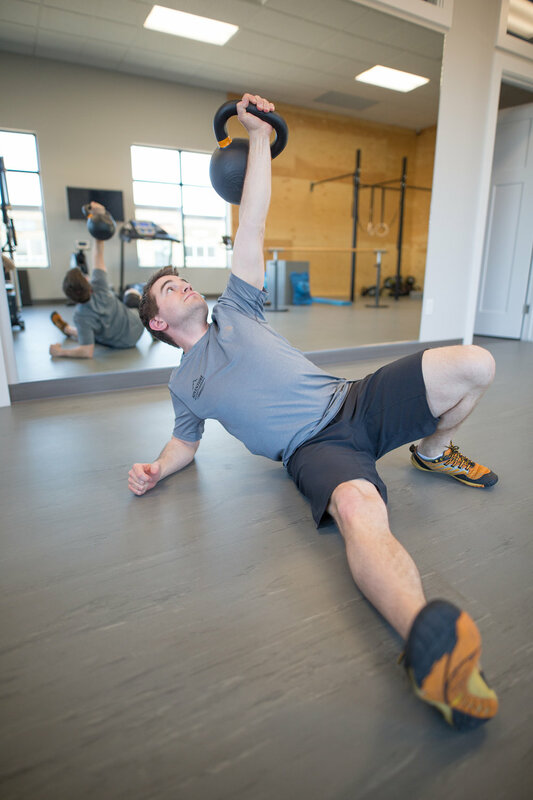 The unique shape of the kettlebell also allows for a large variety of explosive lifts. The geometry of the weight creates special imbalances which helps to strengthen the smaller muscles of the body used to control the weight as well as move it. This piece of equipment will help build athletic fitness in a simple and efficient manner. Please note that a high level of skill is required to use kettlebells safely and effectively. Let us show you how. This rig provides lots of options for a small space. We have room for a squat rack as well as five pull-up stations. The six-foot section also allows for other climbing maneuvers to be explored and trained. Within the climbing rig we also have a plywood wall to throw medicine balls at to develop explosive strength and whole body movement patterns. This area of the clinic will be used to rehabilitate our athletic populations and train emergency service members at a higher level than traditionally found within a physiotherapy clinic.